A marching band is a group of instrumental musicians who usually perform outdoors. It combines movement – usually some type of marching and other movements – with their musical performance. Its instruments typically are brass instruments, woodwinds, and percussion instruments. The music usually has a strong rhythmic component suitable for marching. All marching bands use some kind of uniform. Percussion and wind instruments were used on the battlefield since ancient times. An Iron Age example would be the carnyx. The development of the military band from such predecessors was a gradual development of the medieval and early modern period. A prototype of the Ottoman military band may be mentioned in the 11th-century Divânu Lügati't-Türk. The European tradition of military bands formed in the Baroque period, partly influenced by the Ottoman tradition. 17th-century traveler Evliya Çelebi noted the existence of 40 guilds of musicians in Istanbul. In the 18th century, each regiment in the British Army maintained its own military band. Until 1749 bandsmen were civilians hired at the expense of the colonel commanding a regiment. Subsequently, they became regular enlisted men who accompanied the unit on active service to provide morale enhancing music on the battlefield or, from the late nineteenth century on, to act as stretcher bearers. Instruments during the 18th century included fifes, drums, the oboe (hautbois), French horn, clarinet and bassoon. Drummers summoned men from their farms and ranches to muster for duty. In the chaotic environment of the battlefield, musical instruments were the only means of commanding the men to advance, stand or retire. In the mid 19th century each smaller unit had their own fifer and drummer, who sounded the daily routine. When units massed for battle a band of musicians was formed for the whole. 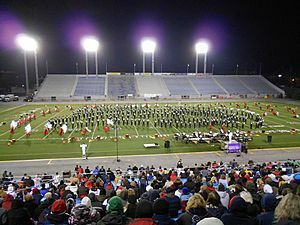 In the United States, modern marching bands are most commonly associated with performing during American football games. The oldest American college marching band, the University of Notre Dame Band of the Fighting Irish, was founded in 1845 and first performed at a football game in 1887. 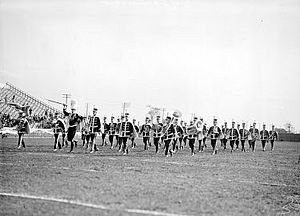 Many American universities had marching bands prior to the twentieth century, which were typically associated with military ROTC programs. In 1907, breaking from traditional rank and file marching, the first pictorial formation on a football field was the "Block P" created by Paul Spotts Emrick, director of the Purdue All-American Marching Band. Spotts had seen a flock of birds fly in a "V" formation and decided that a band could replicate the action in the form of show formations on a field. 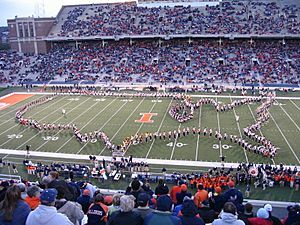 The first halftime show at an American football game was performed by the University of Illinois Marching Illini, also in 1907, at a game against the University of Chicago. Appearing at roughly the same time as the field show and pictorial marching formations at universities was the fight song, which today are often closely associated with a university's band. The first university fight song, For Boston, was created at Boston University. Many more recognizable and popular university fight songs are borrowed and played by high schools across the United States. Four such fight songs commonly used by high schools are the University of Michigan's The Victors, the University of Illinois' Illinois Loyalty, the University of Notre Dame's Victory March, and the United States Naval Academy's Anchors Aweigh. During the 20th century, many marching bands added further pageantry elements, including baton twirlers, majorettes, dance lines, and color guard. After World War I, the presence and quality of marching bands in the American public school system expanded as military veterans with service band experience began to accept music teaching positions within schools across the country, eventually bringing wind music and marching band into both educational curriculum and school culture. With high school programs on the rise, marching bands started to become competitive organizations, with the first national contest being held in 1923 in Chicago, Illinois. State and national contests became common, often featuring parades and mass-band concerts featuring all participating groups. By 1938, competitive band programs had become numerous and widespread, making a national contest too large to manage and leading to multiple state and regional contests in its place. Today, state contests continue to be the primary form of marching band competition in the United States. Marching: instead of a traditional high step, drum corps tend to march with a fluid glide step, also known as a roll step, to keep musicians' torsos completely still. Auxiliaries: adaptation of the flag, rifle, and sabre units into auxiliaries, who march with the band and provide visual flair by spinning and tossing flags or mock weapons and using dance in the performance. Percussion: moving marching timpani and keyboard percussion into a stationary sideline percussion section, or "pit", which has since incorporated many different types of percussion instruments such as: tambourines, crash cymbals, suspended cymbals, bass drum and gong sets, chimes, EWI's (electronic woodwind instrument), and most keyboards. Competitions: marching band competitions are judged using criteria similar to criteria used in drum corps competitions, with emphasis on individual aspects of the band (captions for music performance, visual performance, percussion, guard (auxiliary), and general effect are standard). Marching bands are categorized by style based on primary function, instrumentation, and technique, although many organizations may fill multiple roles. Military bands or corps of drums were historically the first marching bands. Instrumentation in these bands varies but generally consists of brass, woodwinds, and percussion. Due to their original purpose, military marching bands typically march in a forward direction with consistent straight lines. Music is performed at a constant tempo (120–140 BPM) to facilitate the steady marching of the entire military group the band is playing with. The marching step size, or interval, is consistent, and usually at a 6 to 5 (six steps per five yards) or 8 to 5 (eight steps to five yards). This style includes field music units such as drum and bugle corps or bugle bands, pipe bands, and fife and drum corps. Active duty military marching bands often perform in parades with other military units and march in the same manner as other military personnel. 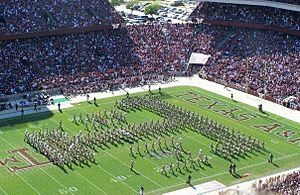 Due to a lack of appreciation, competition venues, and military personnel, almost all military marching bands have disappeared from schools in the United States, with exceptions including the Fightin' Texas Aggie Band from Texas A&M University, the Highty-Tighties of the Virginia Tech Corps of Cadets, and the Cadets of Norwich University Military College of Vermont. There is also a pocket of about 80 high school military-style marching bands in Eastern Texas. Unlike in the United States, military style marching bands have a strong presence in Latin American countries, especially those that have strong military traditions, most importantly of Prussian, French, Spanish and Portuguese origins. Such bands are found in Chile, Argentina, Bolivia, Brazil, Uruguay, Colombia and Peru. But in Ecuador and Venezuela, corps of drums is the main military style band for schools. Military style corps of drums are also seen in schools, colleges, and universities in Mexico and in Mexican schools in the US merely using only the snare drum and the bugle (in some schools the instrumentation can be larger). These bands also are present in Guatemala, Nicaragua, El Salvador and Panama, while military style bands are in service in Commonwealth and ex-French nations in the Caribbean and in Belize, given British and French influences. The United Kingdom keeps the military style tradition with many civil and youth bands in all of the UK keeping the military band traditions of the country, either as marching wind bands, Corps of Drums, bugle bands, pipe bands, and in Northern Ireland, fife and drum bands. Examples would be the Royal British Legion bands, and the bands of the various UK youth uniformed organizations. Styled on the UK military tradition, Fiji's Military Forces also have a marching band. Military style marching bands are also commonplace in Germany, Austria, the Russian Federation, Ukraine, Belarus, Italy, Spain, Portugal and France. German and French military style band types can even extend to Corps of Drums and fanfare bands staffed full-time by civilian musicians, and even to the Bagad bands in Brittany and outside France made up of bagpipers. Spanish band traditions include military style brass bands, marching bands (using brass, woodwinds and percussion) and bugle bands and the Asturias region's unique pipe bands. Military style bands have, in the Netherlands and Belgium, gave birth to yet another type of marching band, the fanfare orchestra, which is like a brass band but with differences in instrumentation. The Netherlands also has a strong corps of drums tradition present with several civil corps plus few military brass bands presently active, plus veterans bands made up of retired musicians and reservists. Corps Style bands directly reflect the trends seen in modern drum and bugle corps of Drum Corps International (DCI). Unlike the military band style, drum corps style step sizes are constantly changing to accommodate the differing forms the band is creating on the field. Forms may be linear, curvilinear, or scatter. Music selections can include anything from symphonic music, film scores, to world music, jazz, rock, or pop music. Unlike a military band's use of baton twirlers, Corps Style bands may include a "color guard" that spin flags, rifles, sabres—and may also incorporate dance. Other visual elements unique to the corps style is the usage of props, backdrops, and even costuming – with the purpose of adding more theatrical elements to the show. Other elements unique to the Corps Style bands are the incorporation of the front ensemble. This includes the usage of keyboard percussion such as: xylophone, marimba, and bells; and/or any other color percussion instruments such as: timpani, cymbals, conga, tambourine, triangle, drum set, etc. The front ensemble may also use sound amplification or electronic instruments such as synthesizers. The corps style constantly evolves, with contributions from college bands, high school bands, and drum and bugle corps throughout the United States. Typically, corps style bands gear their performances for marching competitions and marching festivals. Competitions featuring the corps style on the national level include: Drum Corps International, Winter Guard International, and Bands Of America. Traditional Style bands, also known as Show Bands, are marching bands geared primarily towards crowd entertainment and perform on football fields. Typically, they perform a routine before the game, another at halftime, and sometimes after the game as well. 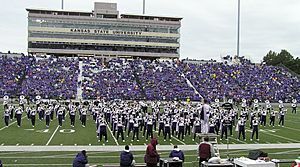 Competitive show bands perform only one show that is continually refined throughout a season, while bands that focus on entertainment rather than competition usually perform a unique show for each game. These shows normally consists of three to five musical pieces accompanied by formations rooted in origin from Patterns in Motion, a book penned by band director William C. "Bill" Moffit, bandmaster of Purdue University All-American Marching Band and University of Houston Spirit of Houston. A recognizable style of show band is the one fielded by historically black colleges and universities (HBCUs). HBCU bands utilize the traditional "ankle-knee" high step and music selections are largely based on R&B, hip-hop, and contemporary popular music. In addition to traditional drill formations, HBCU bands feature heavily choreographed dance routines as part of their performances. Many of these bands may have a twirler line and/or a dancer line, but not necessarily flag twirlers. One of the most notable depictions of HBCU bands is the 2002 film Drumline. The history of African-American marching bands was explored through a 2018 exhibition called "Marching On: The Politics of Performance" in New York City. 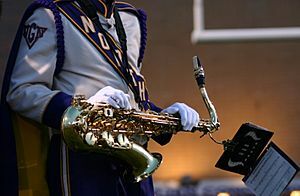 HBCU bands are a significant part of African-American musical culture and HBCU bands often surpass their associated football teams in popularity, a phenomenon that is uncommon among collegiate and high school marching bands. In 1989, as part of the celebrations for the bicentennial of the French Revolution, the Florida A&M University Marching 100, one of the most prolific HBCU bands in the country, was selected as the official representative of the United States in the bicentennial parade. 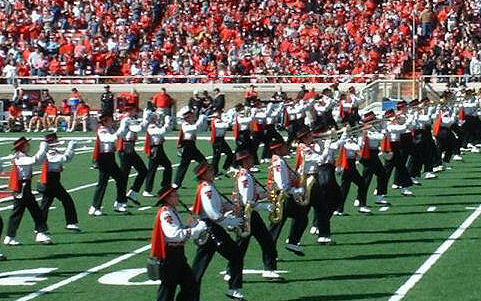 Another style of show band is that used by many of the Big Ten Conference marching bands, a semi-military and semi-corps style. These bands perform a show that is designed to entertain the audience, but feature more traditional symphonic styles of music (marches, film scores, jazz, or older pop music) as well as some contemporary music. 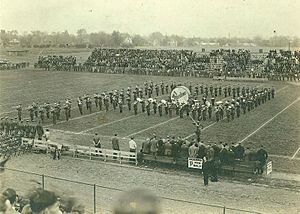 Big Ten style show bands have been influential in creating some of the earliest marching band innovations, and the style is used in high schools throughout much of the United States. Most show bands of either type include the traditional military band instrumentation of woodwinds, brass, and battery percussion. Some also include the front ensemble keyboard percussion, and may also incorporate the use of a color guard for flag, and rifle routines as well as a dance line. Carnival bands are a United Kingdom variant of show bands. Carnival bands typically march in time to the music, and may also participate in parades and competitions.. They contain brass and percussion, but may or may not use woodwinds. In The United States, specifically Southern California, carnival bands (known as Parade bands in the states) perform regularly in parades and parade competitions. These US bands are also modeled on the country's military band tradition. Scramble bands (also referred to as 'Scatter' bands) are a variation on show bands. They generally do not march in time with the music, but, as their name implies, scramble from design to design and often incorporate comedic elements into their performances. Most of the bands in the Ivy League use this style, excepting only Cornell University. 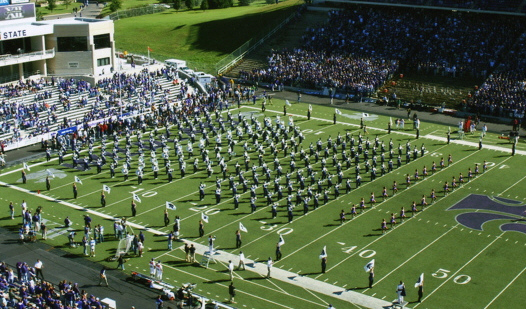 The size and composition of a marching band can vary greatly. Some bands have fewer than twenty members, and some have over 500. American marching bands vary considerably in their instrumentation. Some bands omit some or all woodwinds, but it is not uncommon to see piccolos, flutes, soprano clarinets, alto saxophones, and tenor saxophones. E♭ clarinets, alto clarinets, bass clarinets, and baritone saxophones are less common, but can be found in some bands. Bassoons and oboes are very seldom found on a field due to the risk of incidental damage, the impracticality of marching with an exposed double reed, and high sensitivity to weather. The brass section usually includes trumpets or cornets; French horns, alto horns, or mellophones; tenor trombones; baritone horns or euphoniums; and tubas or sousaphones. E♭soprano cornets are sometimes used to supplement or replace the high woodwinds, while the mellophone often is used in place of the French horn. Some especially large bands use flugelhorns and bass trombones. Specially designed versions of the lower brass have been created for use while marching. These are typically wrapped in such a way that allow the bell to face toward the audience at all times. Bands may also modify their instrumentation to remove slide trombones completely and replace them with another instrument, such as a valved trombone or marching baritone horn. For bands that include a front ensemble (also known as the pit or auxiliary percussion), stationary instrumentation may include orchestral percussion such as timpani, tambourines, maracas, cowbells, congas, wood blocks, marimbas, xylophones, bongos, vibraphones, timbales, claves, guiros, and chimes or tubular bells, concert bass drums, and gongs, as well as a multitude of auxiliary percussion equipment. Drum sets, purpose-built drum racks, and other mounted instruments are also placed here. Until the advent of the pit in the early 1980s, many of these instruments were actually carried on the field by marching percussionists by hand or on mounting brackets. Some bands also include electronic instruments such as synthesizers, electric guitars, and bass guitar, along with the requisite amplification. If double-reed or string instruments are used, they are usually placed here, but even this usage is very rare due to their relative fragility. Unusual percussive instruments are sometimes used, including brake drums, empty propane tanks, trashcans, railroad ties, stomping rigs, and other interesting sounds. A rare inclusion in a marching band that is becoming more popular is the use of electrophones in a marching band. The most common electric instrument seen is a bass guitar, but some schools also use keyboards and lead guitar. To make the electric instruments usable, external power in the stadium is normally used, but some groups may use a car-battery mechanism that requires a car battery and a converter to give the instruments and amplifiers remote power. Most bands have the guitars in the pit with keyboard and auxiliary percussion, but some guitarists do march in the field show. This is made possible by wireless transmission systems that connect a transmitter on the guitar to a receiver hooked to the amplifier. This implementation of equipment can also be used in parades. Some band scores have parts for bass guitar, but in the event that a score does not, the bass guitarist normally plays tuba/sousaphone, bassoon, baritone-bass clef, euphonium-bass clef, or trombone music. It is very rare for a score to have a part for electric guitar, but the guitarist may use oboe or flute music in this situation. Marching band Facts for Kids. Kiddle Encyclopedia.